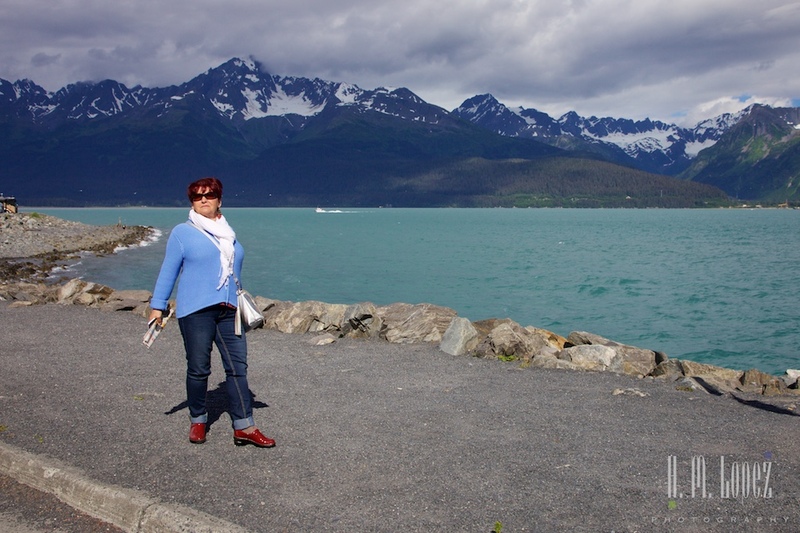 We camped in Seward, Alaska with Joyce, our friend who was visiting from Denver, for the first four days of our stay. 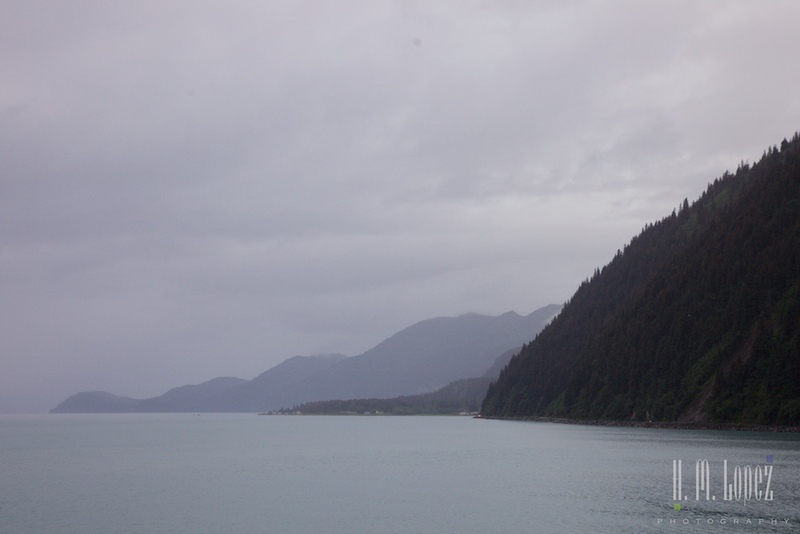 During that time the weather alternated between mostly sunny and beautiful and cloudy and rainy – a good representation of Alaska in the summer. 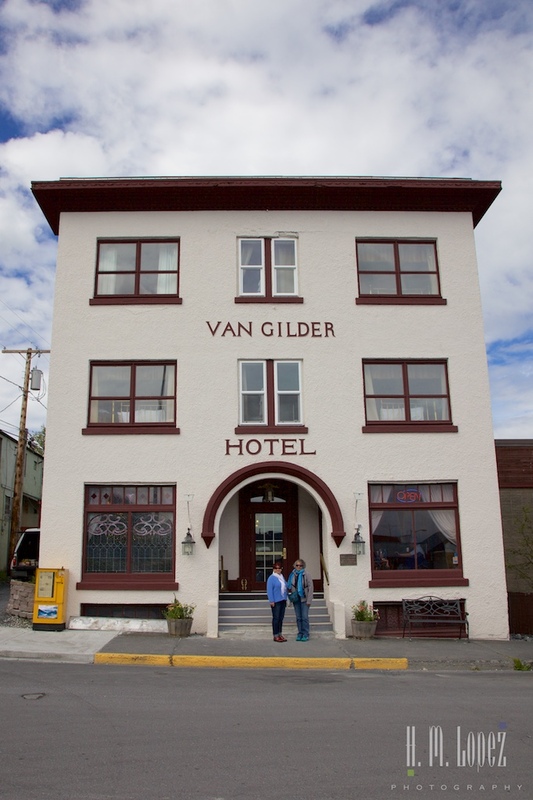 On one of the nicer weather days, we explored the (little) town pretty thoroughly. 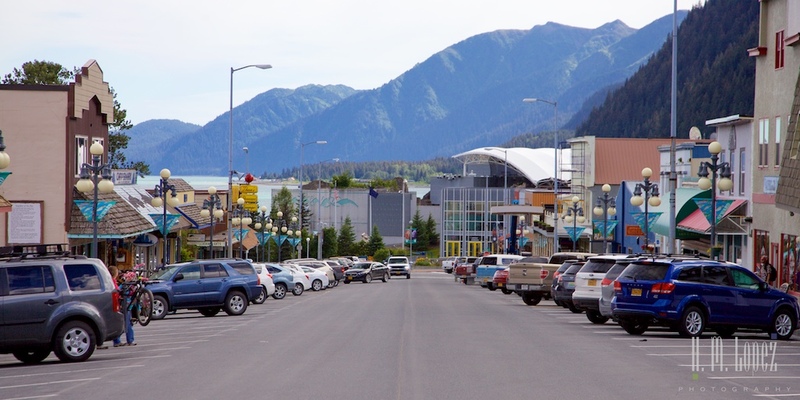 Seward is a fairly touristy town and has a good number of shops and restaurants for its small size. There are also quite a few lovely murals throughout the downtown area. 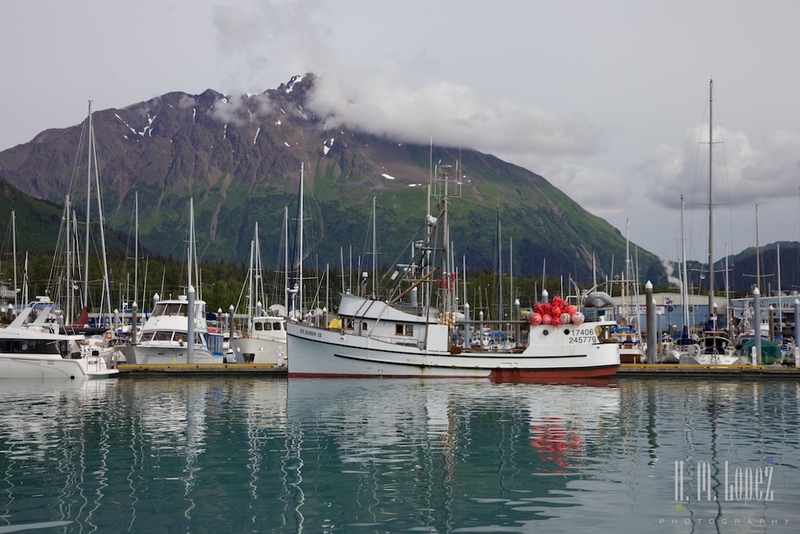 Seward is also a huge fishing destination, and the harbor buzzes with activity every day after the sports fishing boats return. 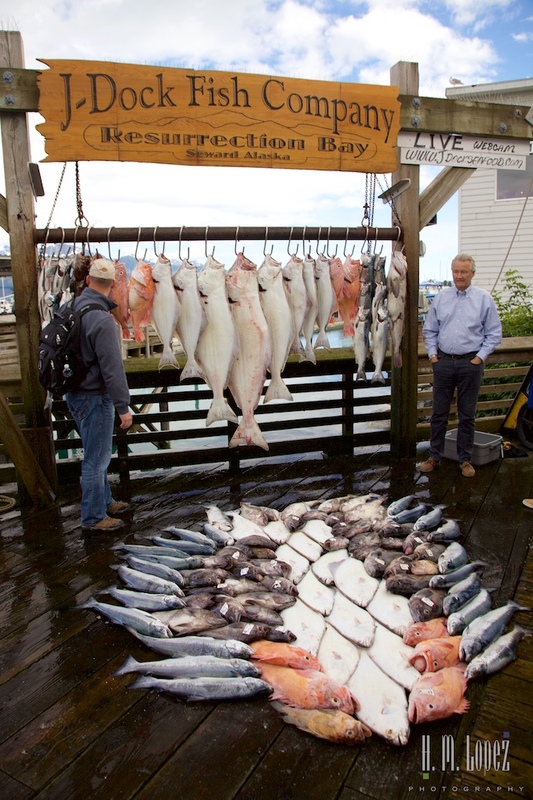 One afternoon we watched some guys setting up a bunch of huge halibut on hooks, while “arranging” the rest of the catch (pretty large fish also) on the ground in front of the halibut. Afterwards all of the proud folks who caught the fish had their photo taken by this display. We thought that was pretty elaborate even for photographs, but come to find out that there is a web cam running a live stream from this dock. Interesting. 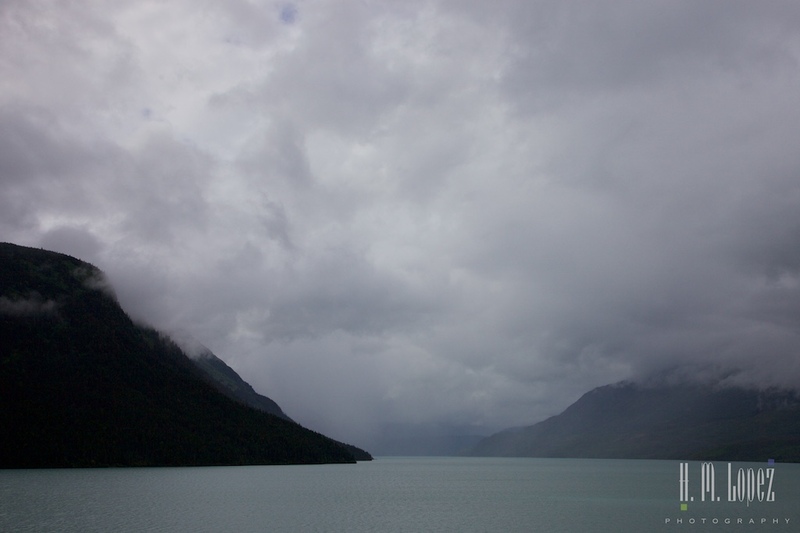 On a cloudy and rainy day, we explored some of the areas outside of town on a drive out on the Sterling Highway. 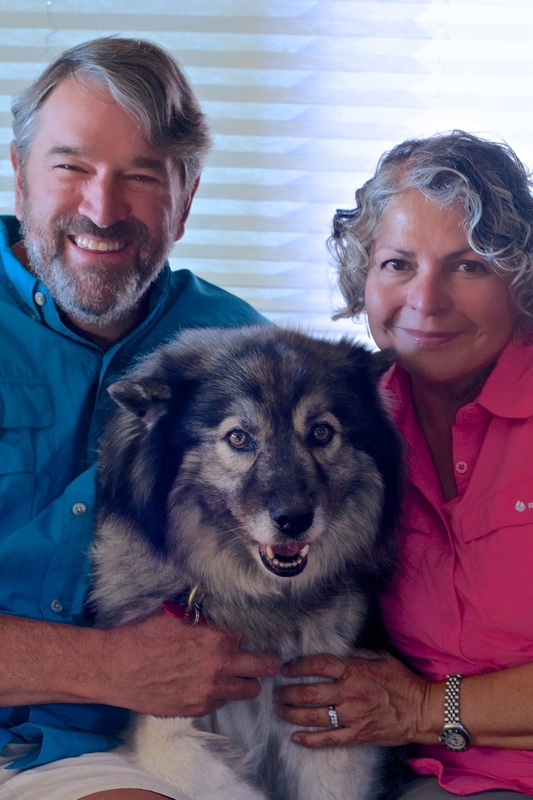 We have yet to see our first bear in Alaska, after seeing quite a few in the Yukon Territory, and were hoping that Joyce got to see one as well. 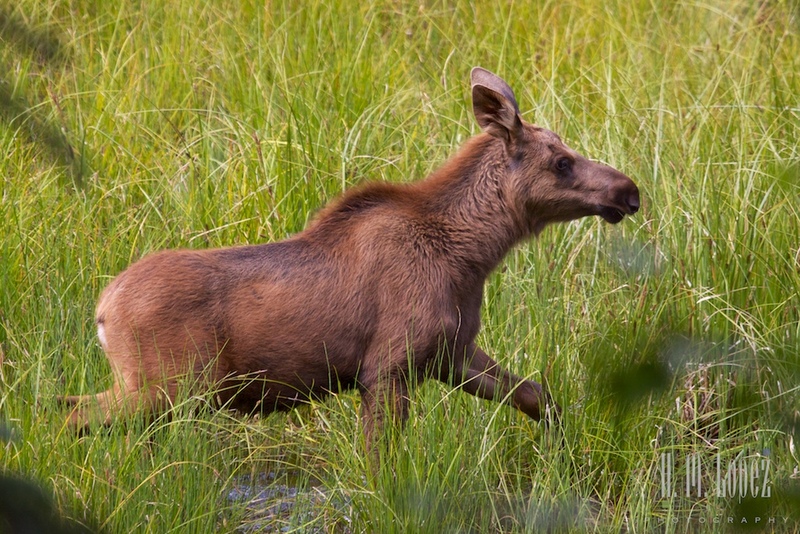 But although we did not find any bears, we did spot a moose cow with two calves. A few people gathered to look at them, and they quickly disappeared into the forest. 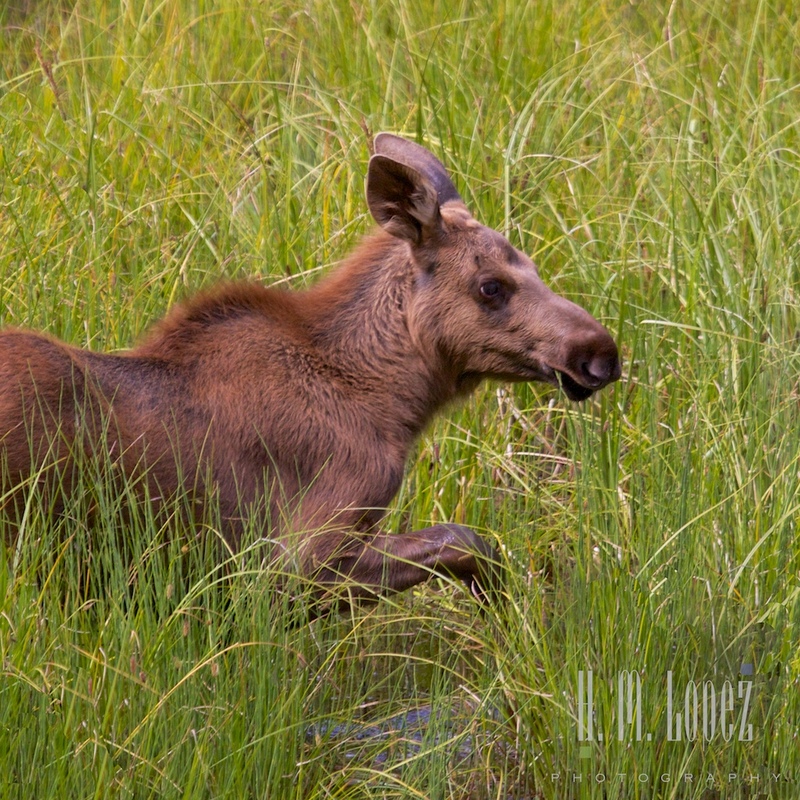 But all three of us got a good look at the calves, with their gangly legs and reddish coloring. 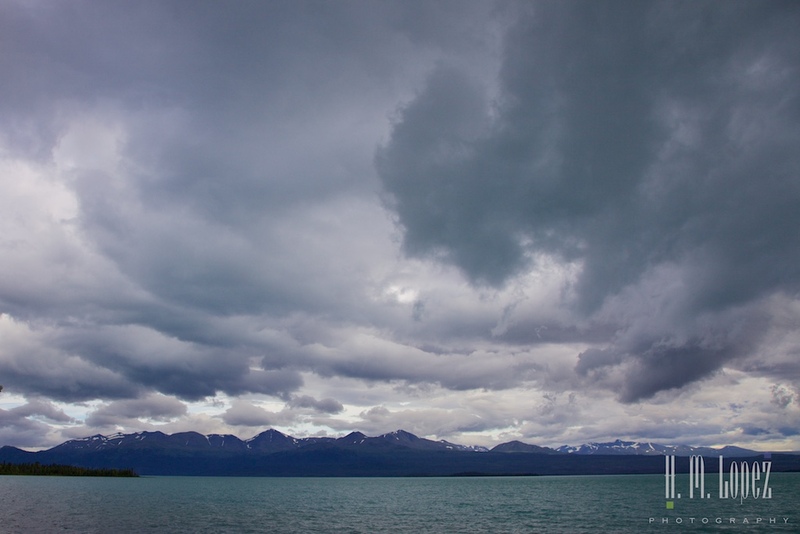 That one day weather alternated between cloudy dry periods and drizzling rain and there were some very cool clouds in the sky. 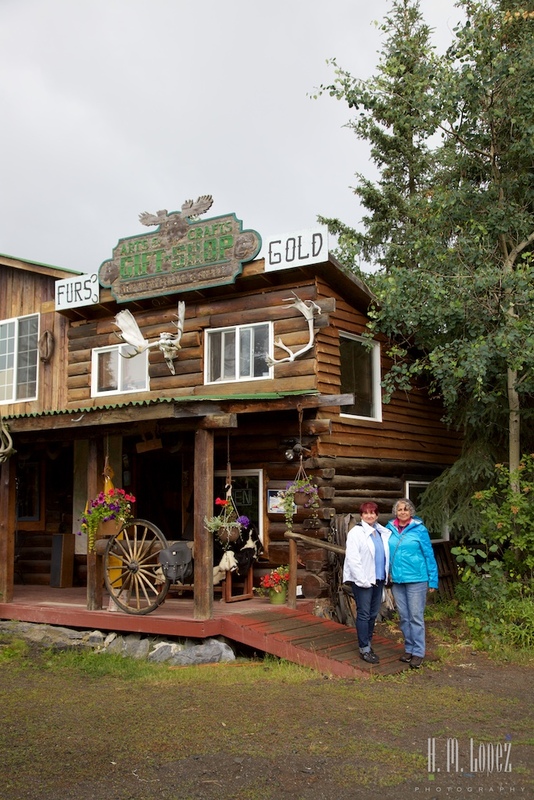 We came across a beautiful cabin with a “Gift Shop” sign and stopped to check it out. 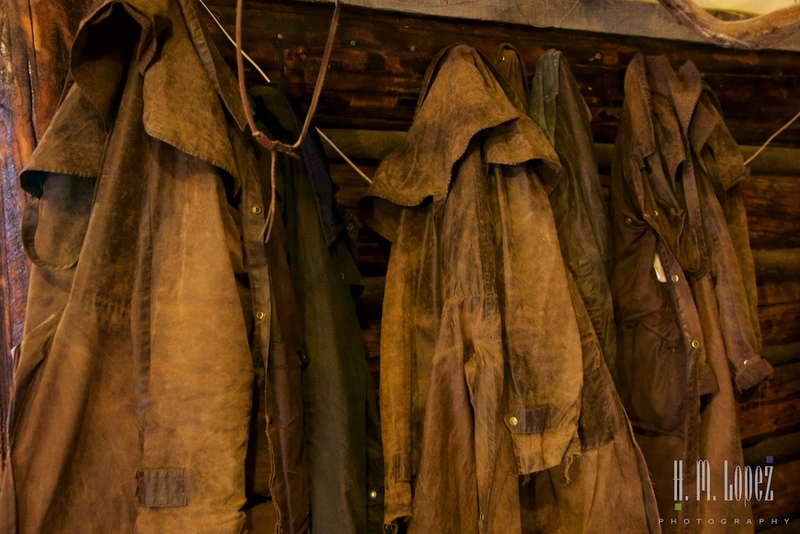 It turned out they did not have a lot to sell at the moment, mostly pelts, but the cabin had an interesting story behind it. 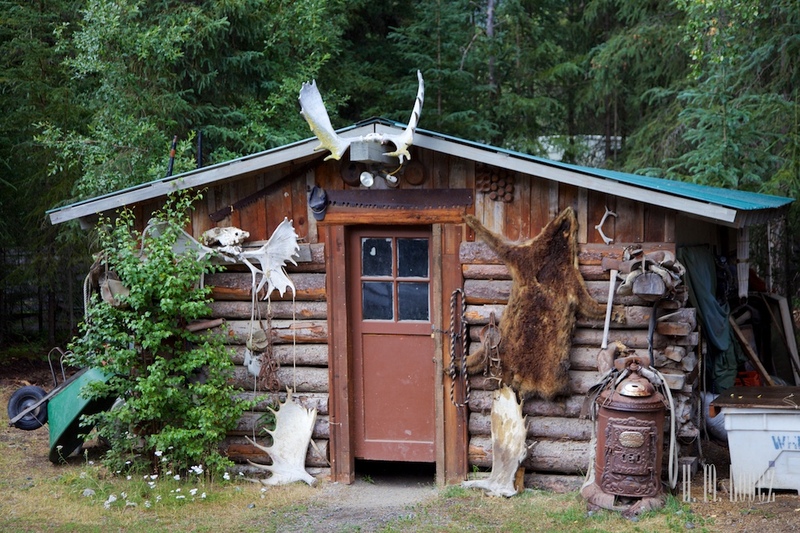 It is one of the original pioneer cabins and the proprietor found and purchased it at another location, and dismantled and reassembled it at this location, log by log. A piece of local history. 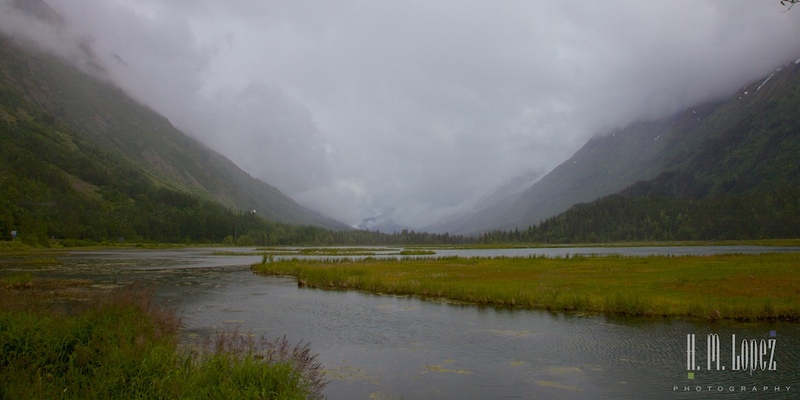 The Kenai River runs alongside parts of the road. 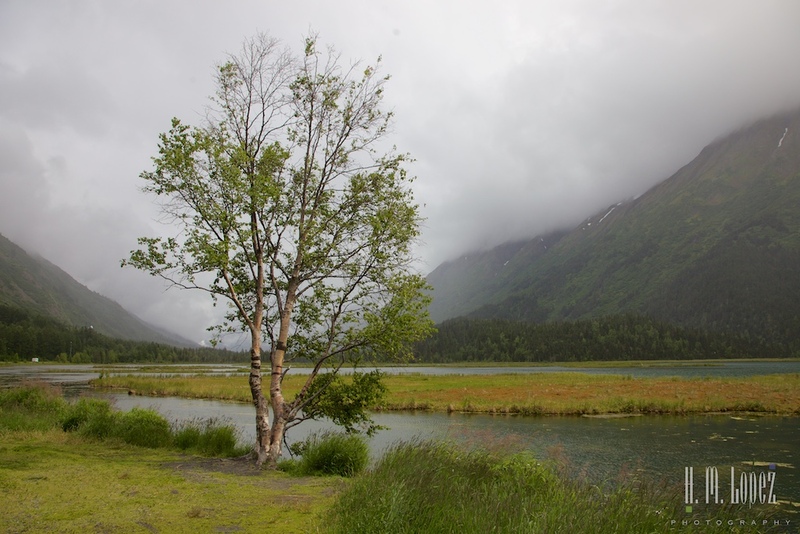 The river has that beautiful glacial color that we have seen in many rivers in the north. 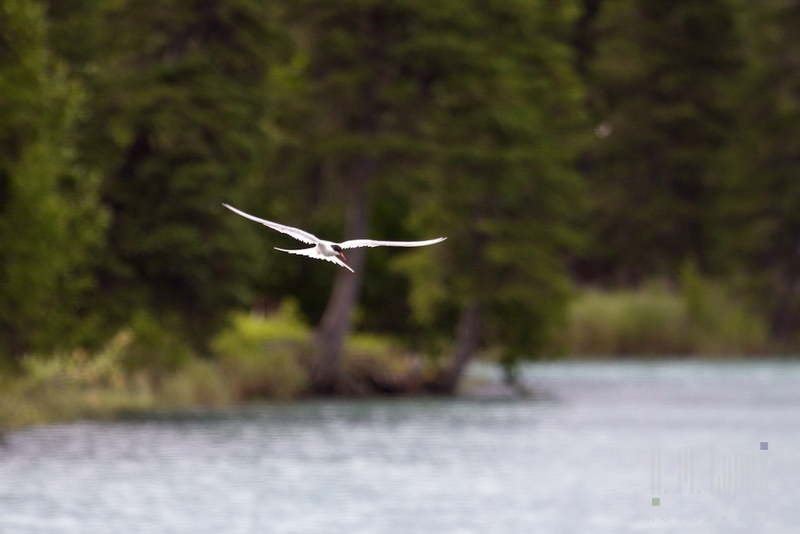 There were lots of graceful arctic terns flying about, it was a beautiful scene. 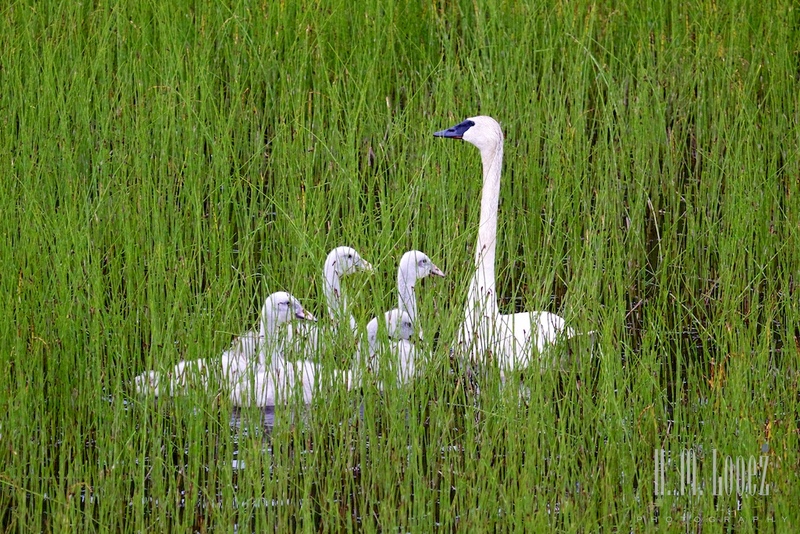 That day was obviously baby day because we later saw a trumpeter swan with four cygnets. 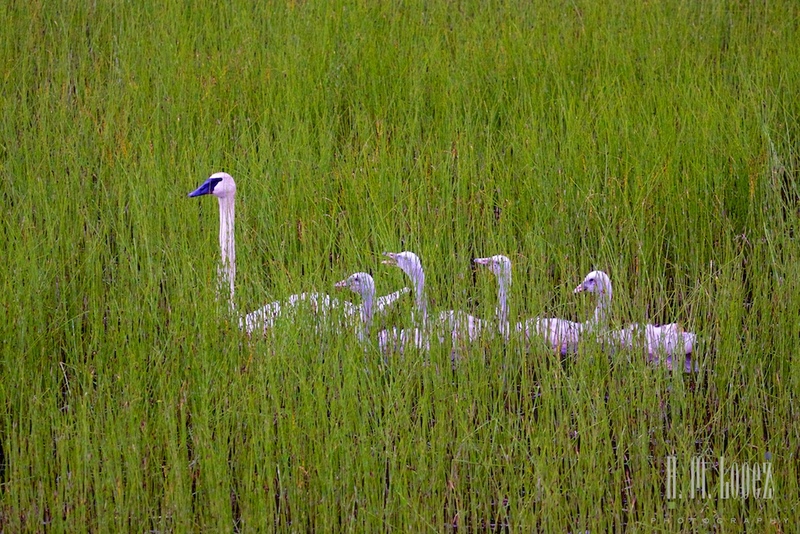 As I was looking at some tall grasses, I spotted one long neck and a few slightly shorter necks popping up amongst them. 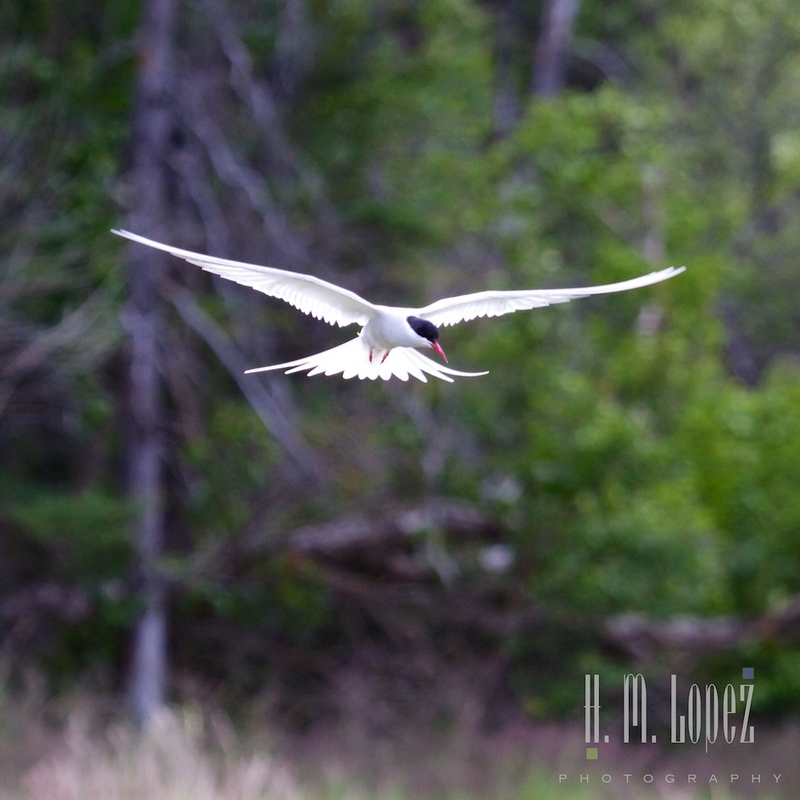 They were in one of many pretty wetland areas we drove by. I always think of ballet when I see the swans – so lovely. When we neared the campground we found these two talkative turkeys walking down the street. Hmmm. 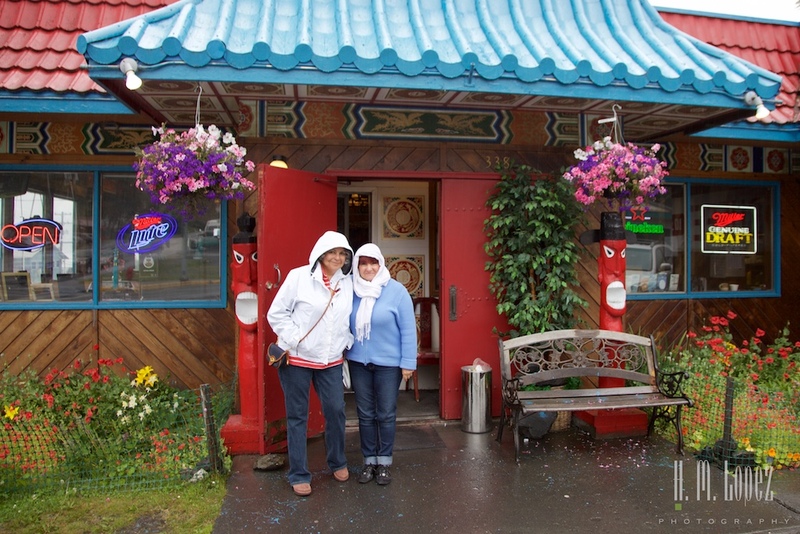 Joyce’s last day here was pretty rainy, and the three of us visited the Alaska SeaLife Center, an aquarium that also rescues and rehabilitates marine mammals. 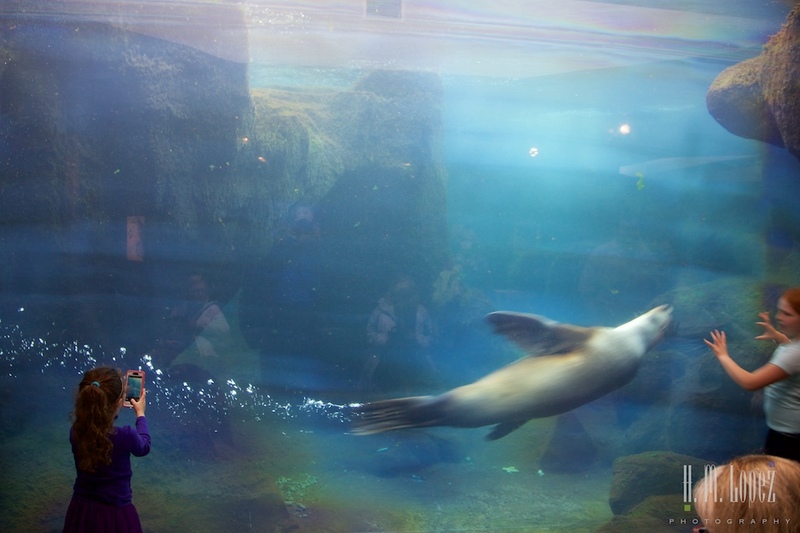 It is a relatively compact aquarium focused on local sea life. 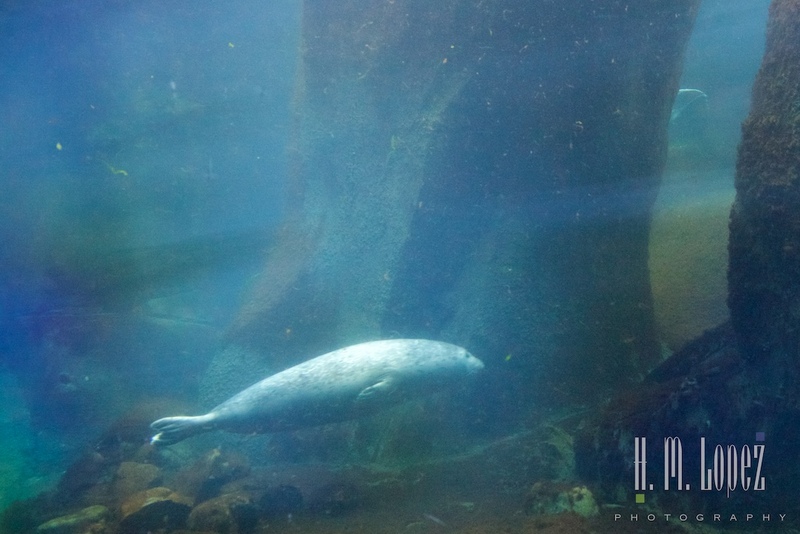 We saw seals and sea lions, but no sea otters as none have been rescued recently (hopefully none needed rescue). 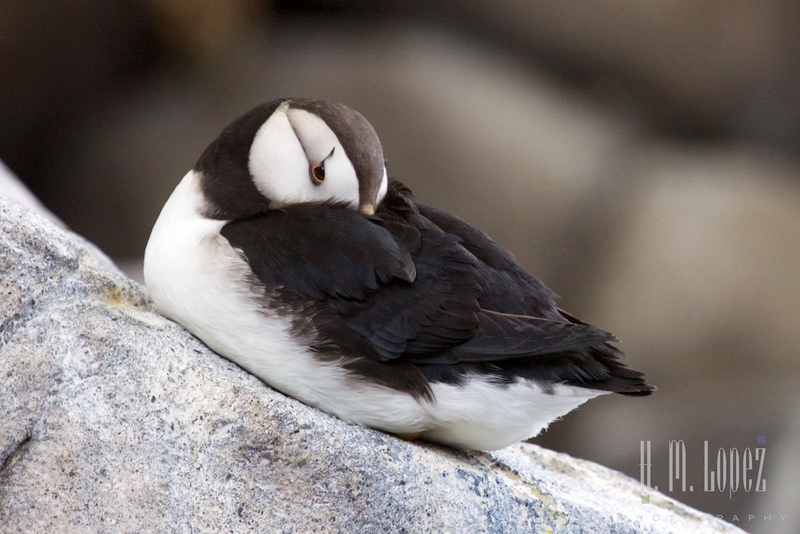 After having seen puffins, common murres and other seabirds in the wild on our boat cruise, it was nice to be able to get a closer look at them and learn more about them in the aviary. 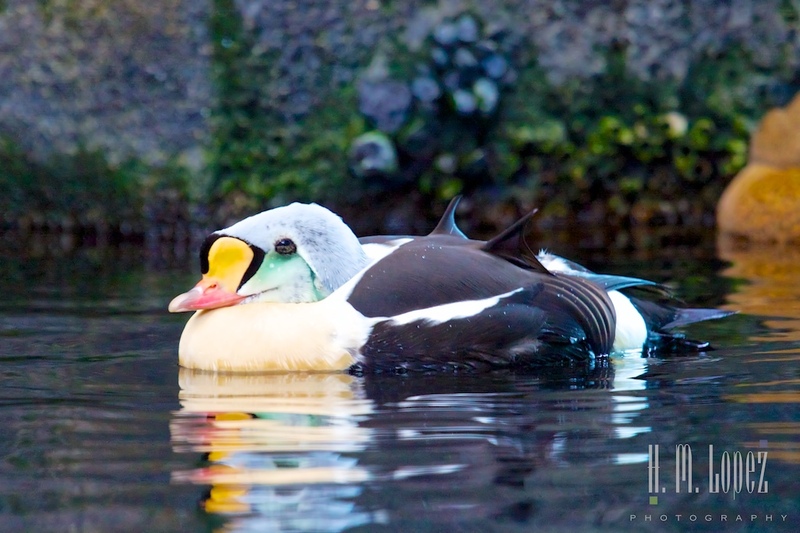 There are common murres, red-legged kittiwakes, harlequin ducks, king eiders, black oystercatchers and other sea birds in the aviary. 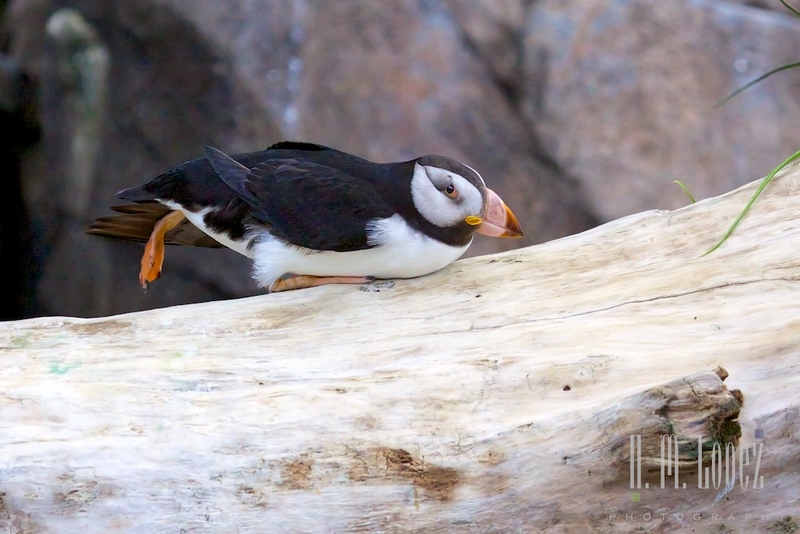 But the horned and tufted puffins steal the show flying out of the water, sitting on the ledges and rocks right next to the people, and landing back in the water in their awkward and entertaining way. 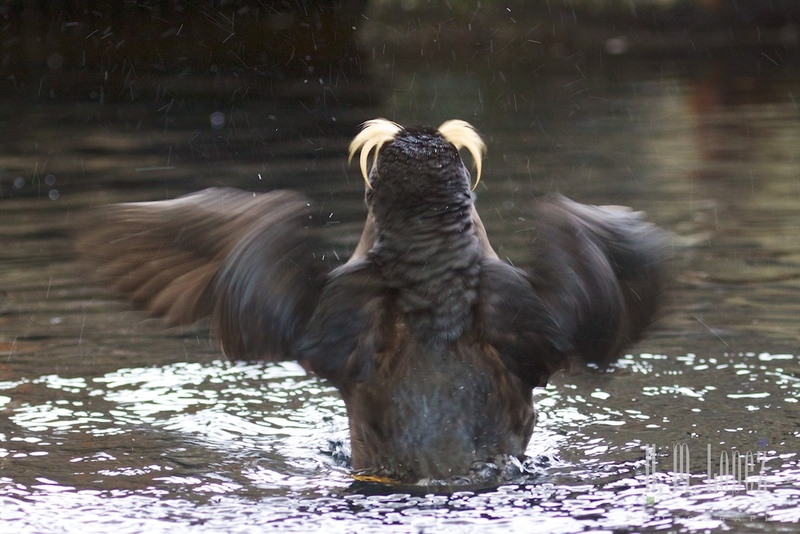 There is a view of the underwater area of the aviary downstairs, where we got to see the various birds diving and “flying” underwater. 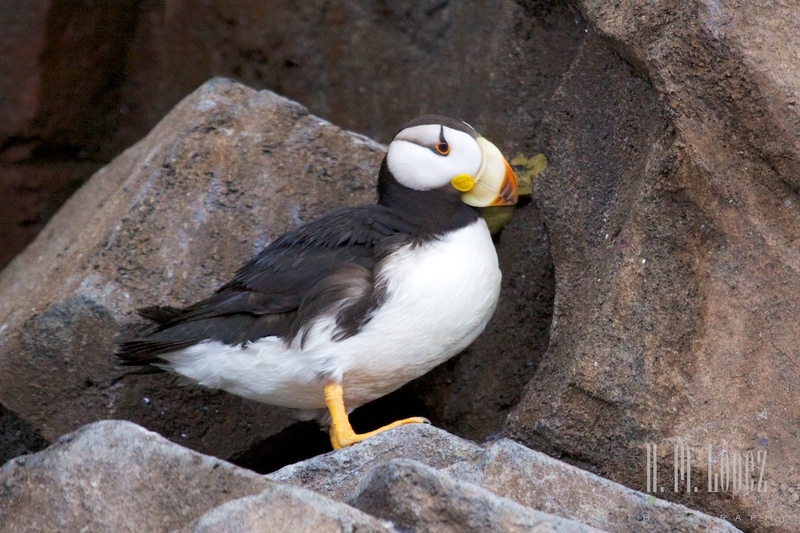 Joyce, who was completely smitten with the puffins on our boat cruise, was also thrilled to see them so up close and personal. 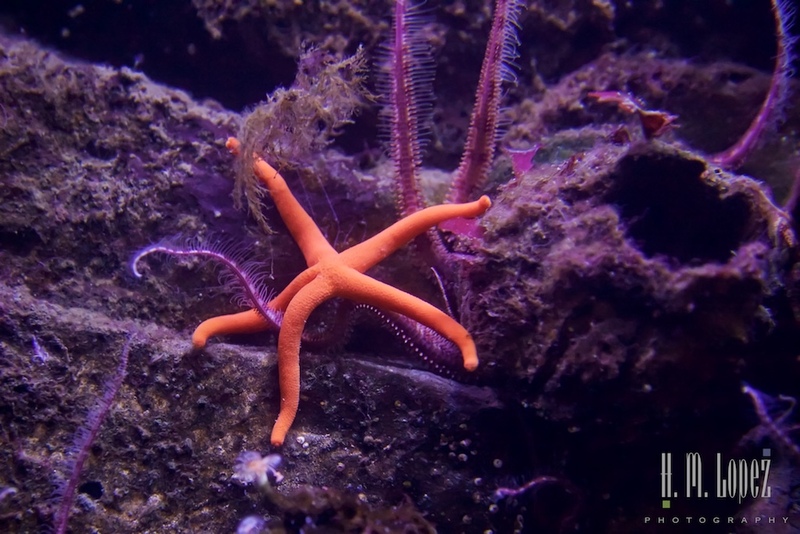 The aquarium has a touch tank with some sea stars and other tidal creatures, and a Pacific octopus that was extremely shy and hid inside a rock “cave” in his tank during our visit. 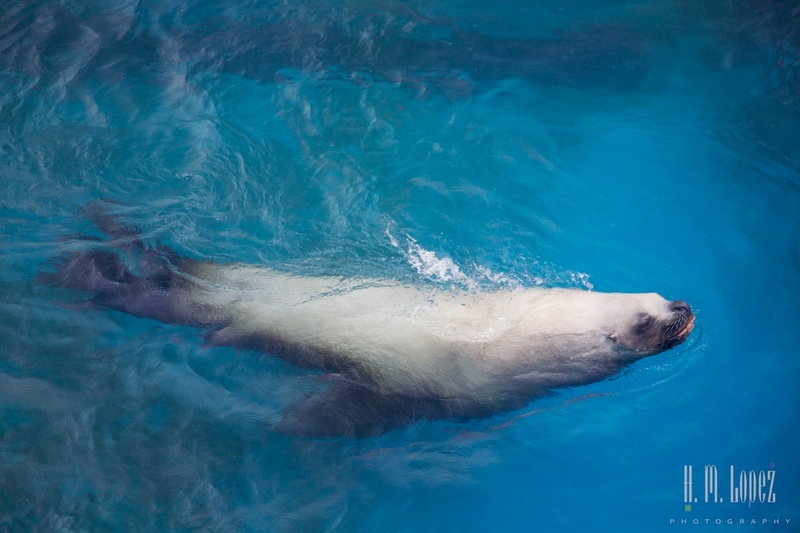 The SeaLife Center also offers educational seminars each day for the general public as well as special “behind the scenes” programs, and other programs for schoolchildren and other groups. We really enjoyed our visit. 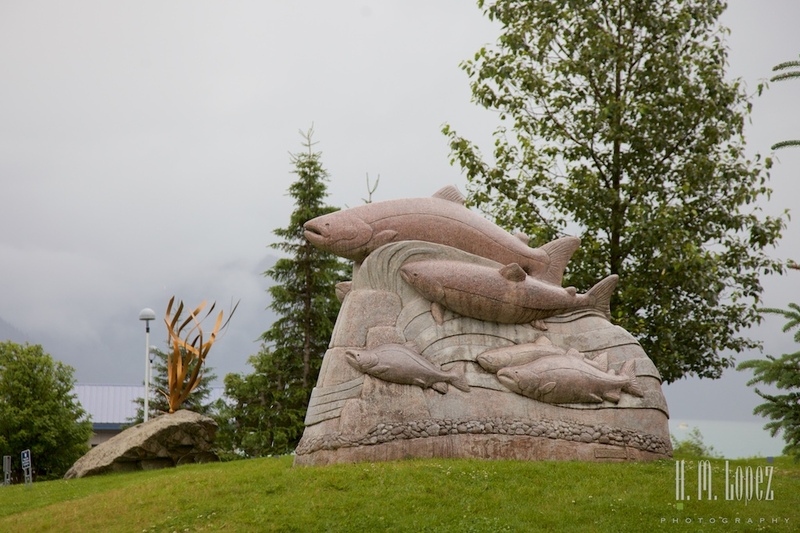 After touring the center with Joyce, it was almost time for her to return to Anchorage for her flight home to Denver. 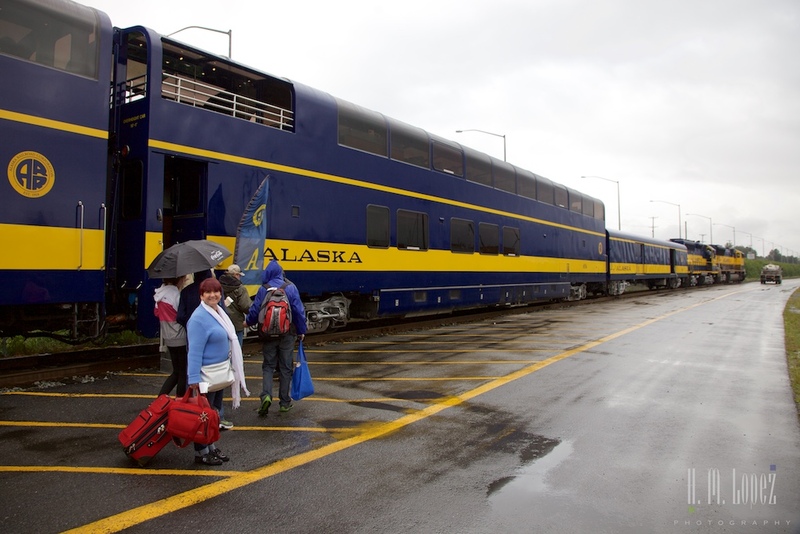 It was then that we realized that her trip included planes, a train, an automobile, a boat AND an RV, all in six days! 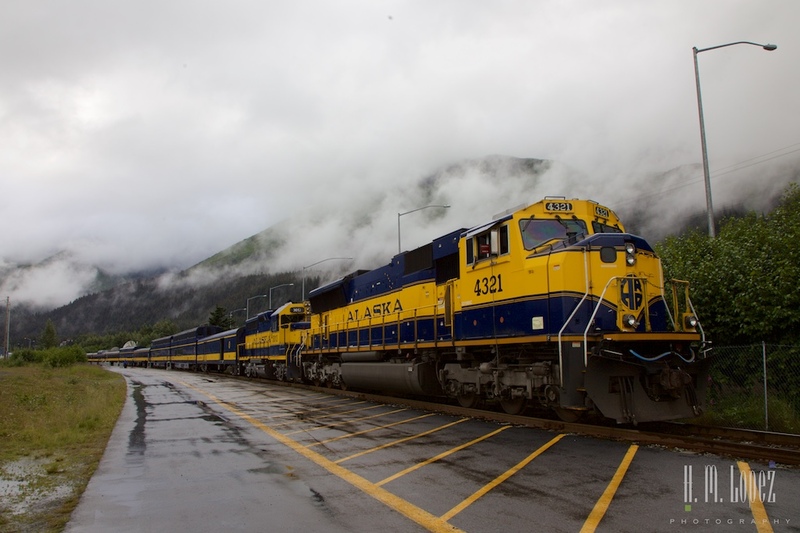 The trains that run from Seward to Anchorage are quite beautiful, which is appropriate since they ride through such beautiful scenery. 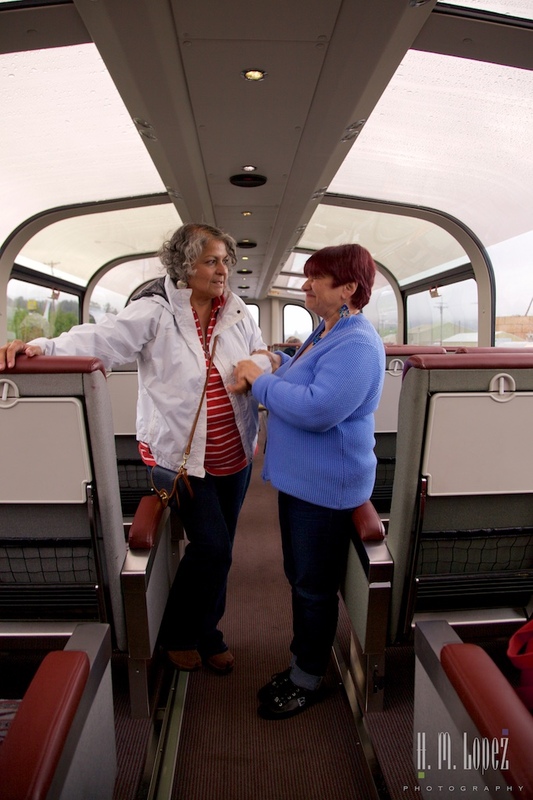 The nice guy boarding the train allowed us to walk Joyce to her seat on the upper deck. 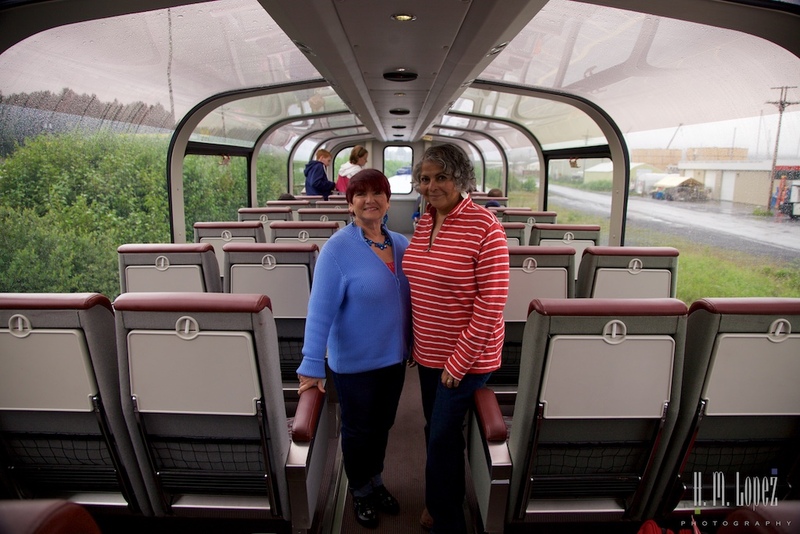 That brought back memories of our train ride eight years ago and made us wish we were taking the train too. Well, maybe we will find an opportunity to take a train ride later this trip. 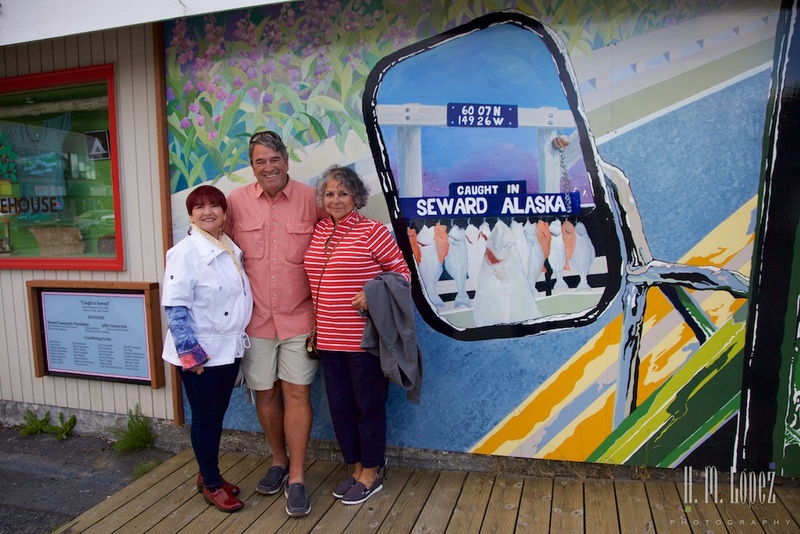 There is a special joy to seeing the beautiful places and animals in nature through the eyes of friends, and having Joyce with us made these first days in Seward especially memorable. 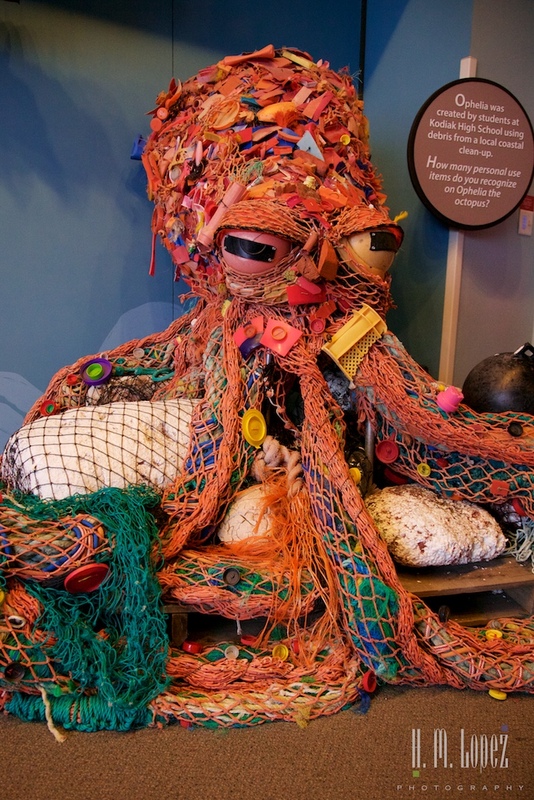 What a fantastic trip you are having. 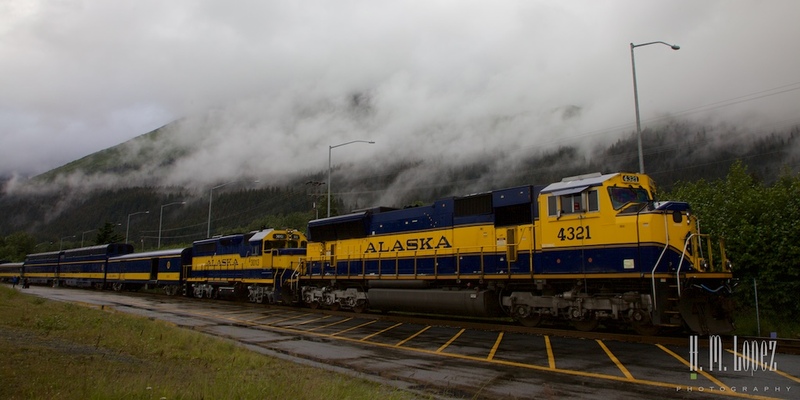 We were in Alaska about 5 or 6 years ago but on a tour so didn’t see as much as we wanted. We are headed that way in our coach next year and will hopefully things in a different light. We just might follow in your path. 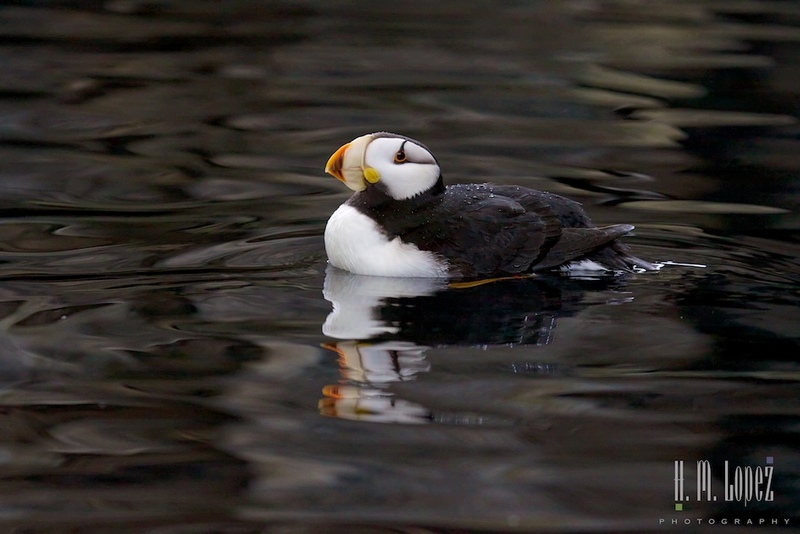 What a treat for your friend to share in some of your exciting adventures:) That horned puffin was so strange looking! Glad you had the close up photo. Yes, we had a great time together, even though it rained part of the time. I remember that header photo! I had one just like it for a while in 2010 😉 I am a mural lover, so when I heard that there was a collection of them, I downloaded a map and went on a treasure hunt. 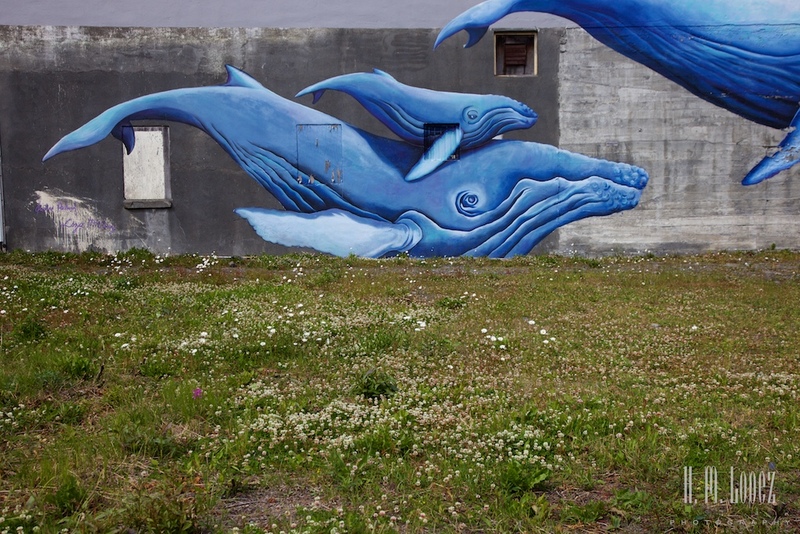 The whale mural I didn’t see though. 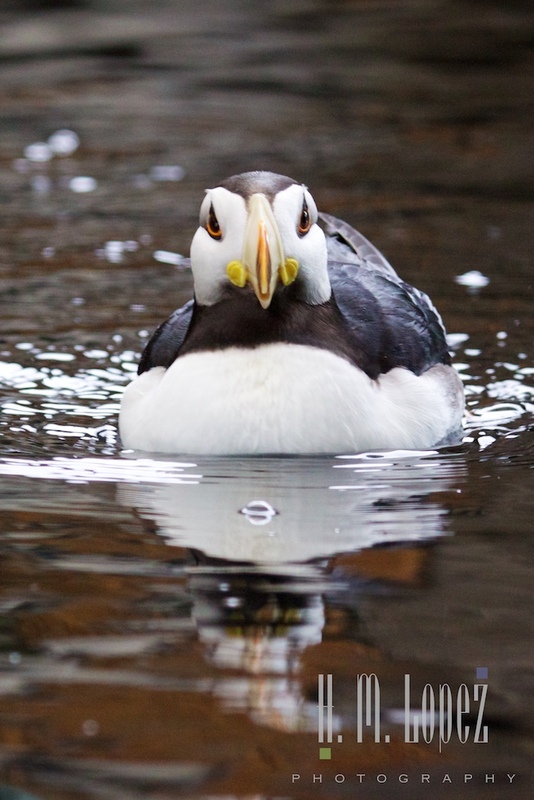 I love seeing wildlife in the wild, but sometimes places like the SeaLife Center afford the best encounters … like those close up looks at the puffins … what’s not to love about them. 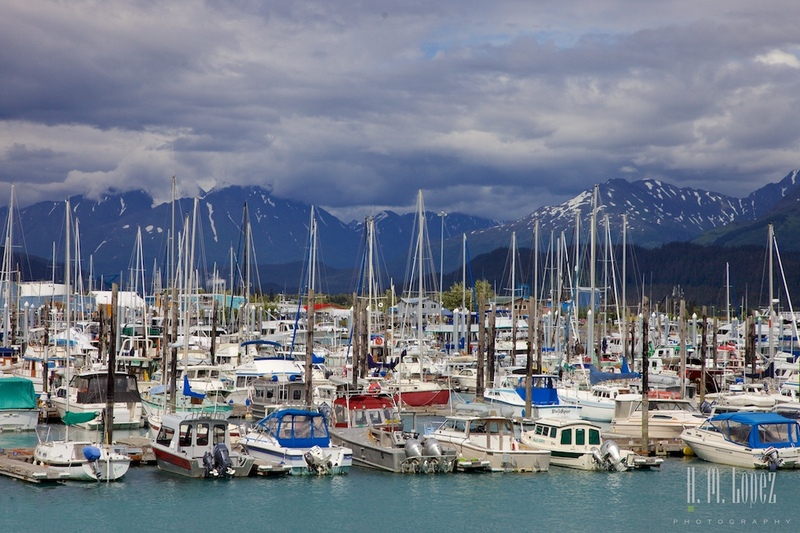 By the way, if you’re still there … we had the best halibut fish and chips at the Marina Restaurant overlooking the small boat harbor. 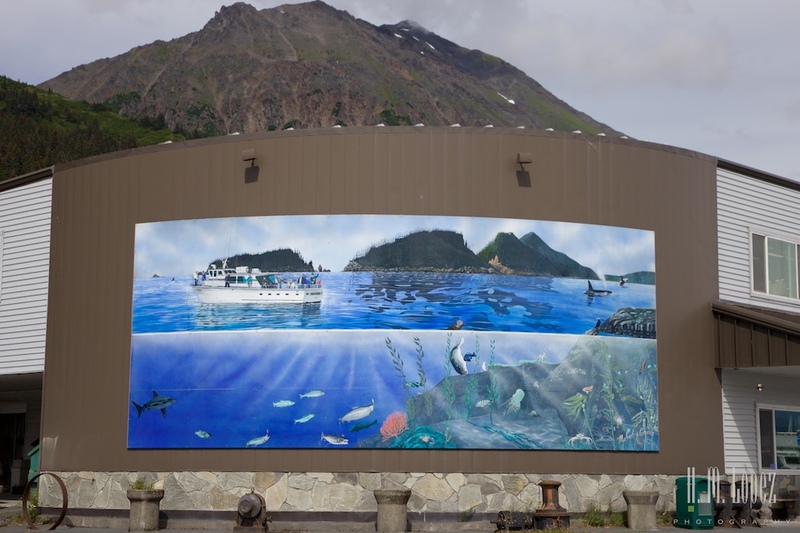 We love murals too! 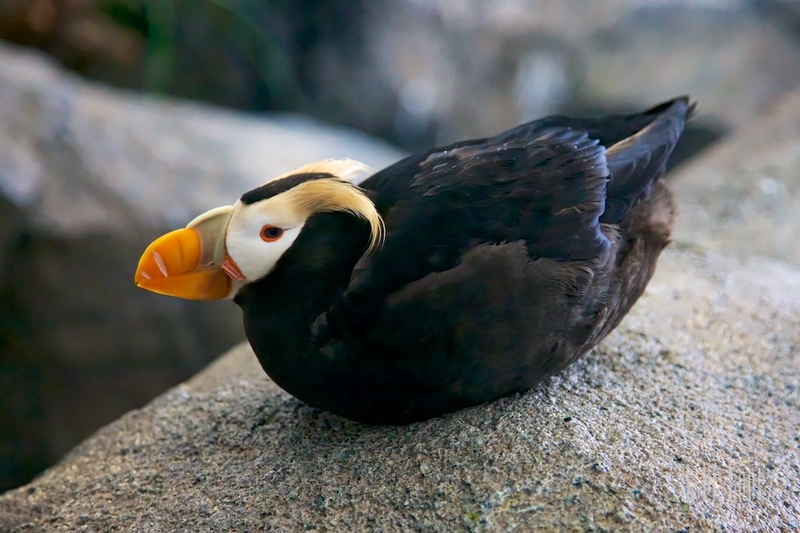 We stood right next to puffins at the center, had to resist petting them! 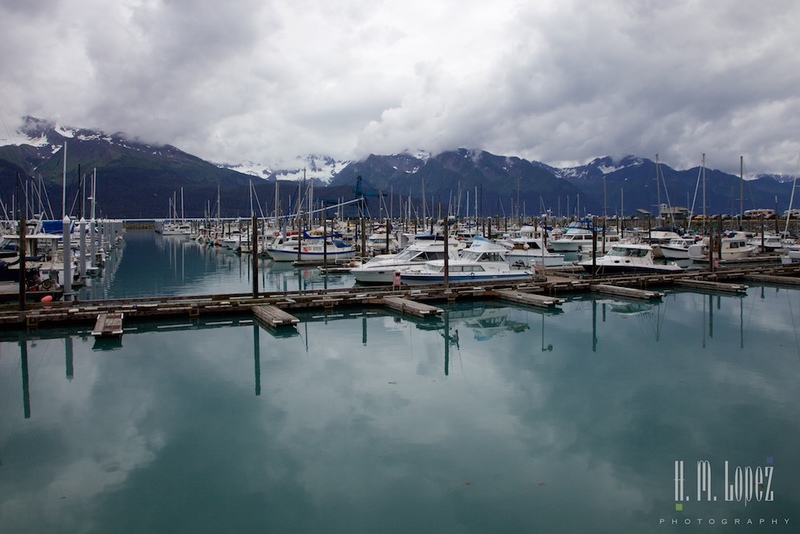 We have left Seward, but we did eat at one of those two restaurants and the fish and chips were excellent. 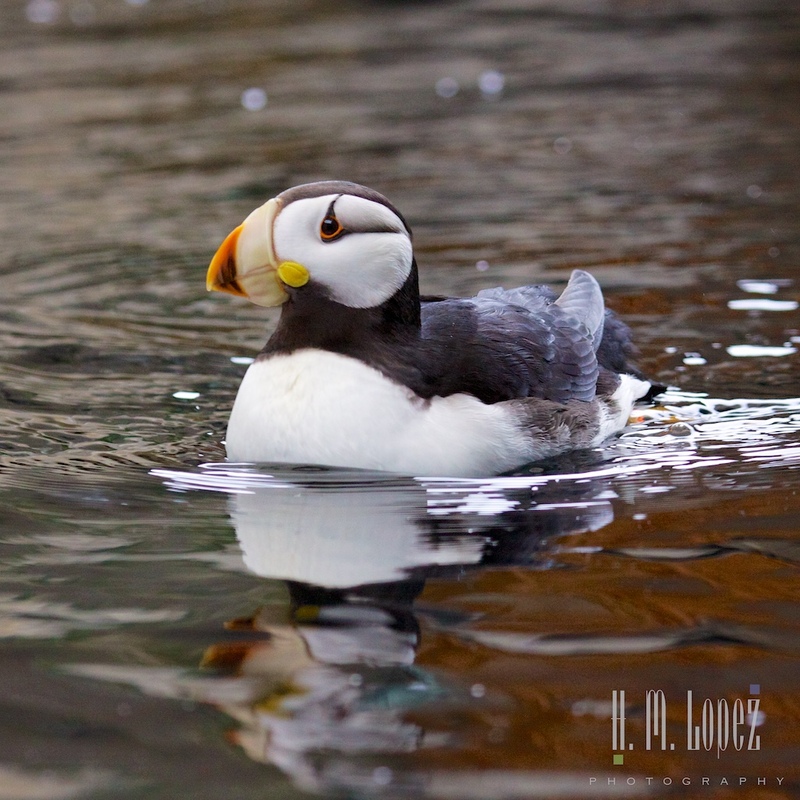 Love the puffin photos! You two are making us wish that we had moved up our trip to this summer. Can’t wait to hear about the next adventure. 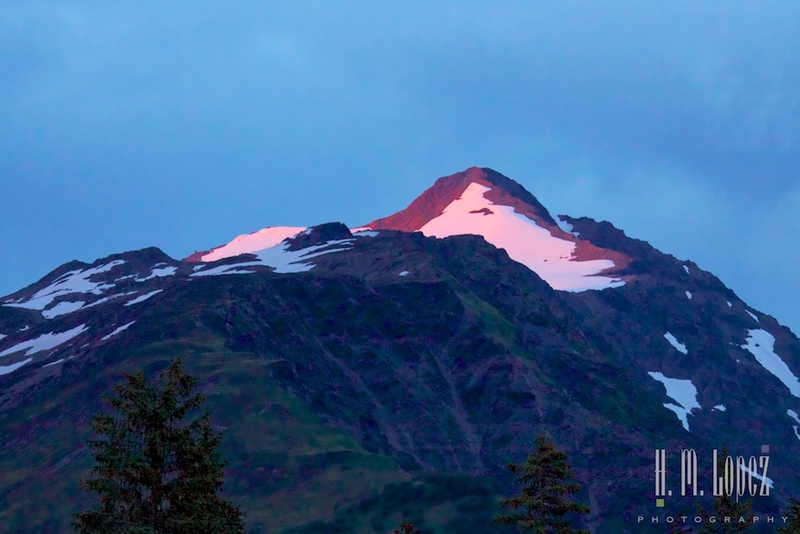 Although your photos of Mount Rainier are equally tempting. Great way to spend a couple of days. I did not see the “Make a Reservation” button on the post??? 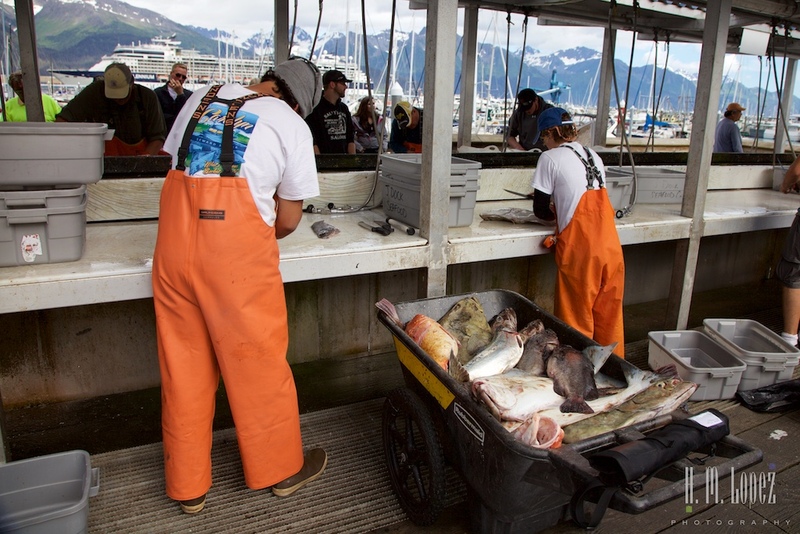 I really liked the webcam of the seafood. Busy little place! Thanks! lol. 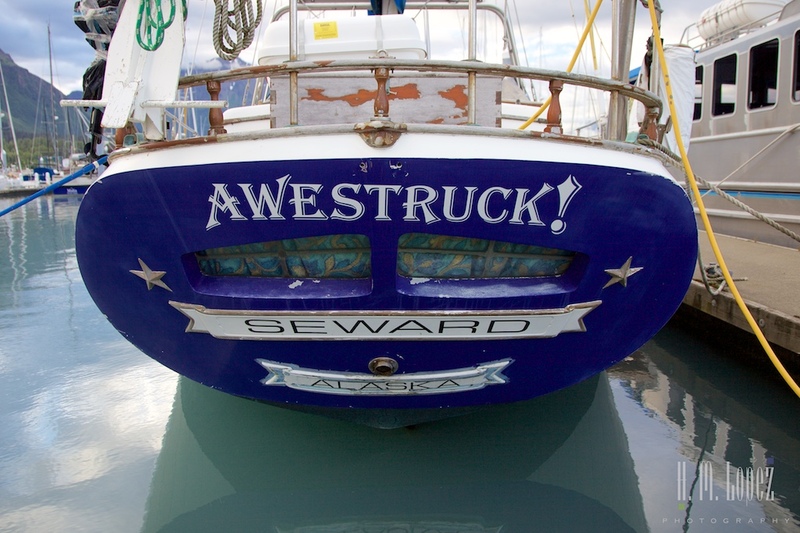 We did love Seward!